The Princess Anne, Princess Royal (Anne Elizabeth Alice Louise; born 15 August 1950), is a member of the British Royal Family and the only daughter of Elizabeth II. She is the seventh holder of the title Princess Royal, and is currently tenth in the line of succession to the British Throne. At the time of her birth, she was third in line, but moved to second place from when her mother became Queen, until the birth of her brother, The Prince Andrew, in 1960. 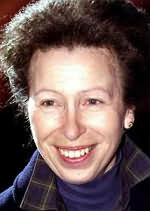 The Princess Royal is most famous for her charitable work. 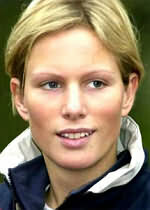 She is the only member of the British Royal Family to have competed in the Olympic Games. Princess Royal and her family reside at Gatcombe Park, where "The Festival of British Eventing" is held each year. For more information about - Princess Anne. Zara Anne Elizabeth Phillips, MBE (born 15 May 1981) is the second child and only daughter of HRH The Princess Anne, Princess Royal, she is twelfth in the British Order of Succession. An elite equestrienne, Zara is the reigning Eventing World Champion and was voted BBC Sports Personality of the Year by the British viewing public (an award her mother, Princess Anne, won in 1971). Zara was made a Member of the Order of the British Empire (MBE) in the 2007 New Years Honours List for her services to equestrianism. She claimed individual gold on her horse Toytown in the three-day eventing competition at the World Equestrian Games in Germany, and also helped Great Britain secure a team silver. The Jackdaws Castle training establishment is just five miles from the Cotswold town of Stow-on-the-Wold. When Supreme Quest won the extended three-mile novices' handicap hurdle at Uttoxeter on April 1 2002, Jonjo achieved the distinction of becoming the first person to win 100 races in a British season as a jockey and a trainer. Patricia Rosemary Smythe (22 November 1928 – February 27, 1996), most commonly known as Pat Smythe, was one of Britain's premier female showjumpers. Pat's first taste of showjumping came after her relocation to the Cotswolds, after varied success at gymkhanas Pat was able to compete in her first International Show. Eventually she was asked to join the British team in 1947. In 1949 Pat and her mother moved to Miserden in the Cotswolds. She later married in 1960 after the Summer Olympics of the year to childhood friend Sam Koechlin and became Patricia Koechlin-Smythe. This meant a move to Switzerland and it was there that many of her books were written. Sam died in 1986 and Pat moved back to the Cotswolds. Pat's death came due to heart disease when she was 67. She was also the subject of a commemorative plate. Born in Cheltenham, Gloucestershire, Frederick James "Fred" Archer (January 11, 1857 - November 8, 1886) was an English flat race jockey who was the most successful sportsman in horse racing during the Victorian era. Archer was Champion Jockey for 13 consecutive years until 1886, riding 2748 winners from 8084 starts. Fred Archer was a legend in his lifetime, and has been ever since. Intelligent and ambitious, he was a natural horseman who understood tactics too. He was simply the best all-round jockey that the Turf has ever seen. 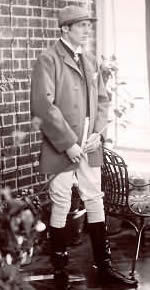 Fred Archer was born in Cheltenham, the son of William Archer (winner of the Grand National on Little Charlie in 1858). He was apprenticed to the trainer Mathew Dawson as an 11 year old boy. His first important win was in the 1872 Cesarewitch, and his first Classic in the 1874 2000 Guineas, after which he became Lord Falmouth's retained jockey. Lord Falmouth was Dawson's principle owner and the Archer/Dawson/Falmouth combination became amazingly successful. Mark Anthony Peter Phillips (born September 22, 1948) is a former Olympic gold-medal-winning horseman and first husband of Anne, Princess Royal. and father of the reigning Eventing World Champion Zara Anne Elizabeth Phillips. In 1972, he was a member of the British three-day event team, which won the gold medal at the Munich Olympics. He won the Badminton Horse Trials in 1971 and 1972 riding Great Ovation, in 1974 on Colombus, and in 1981 on Lincoln. In 1998, Phillips designed the cross-country venue for the Red Hills Horse Trials, a qualifying event for the Olympics located in Tallahassee, Florida, USA. 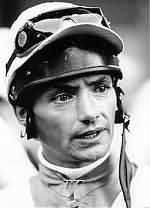 Walter R. Swinburn (born August 7, 1961 in Oxford) is the son of Wally Swinburn, himself a successful rider on the flat in Ireland. now a retired flat racing jockey who competed in Great Britain and Ireland as well as internationally. Nicknamed the "Choirboy", Swinburn rode his first winner, Paddy's Luck, on July 12, 1978 at Kempton Park but gained considerable fame for riding the superstar Shergar to victory in the Epsom Derby in 1981 by a record 10 lengths. He went on to win the Derby two more times. 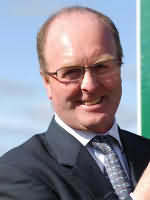 After retiring as a winner of numerous Group One races, including eight British Classics, Walter Swinburn began working as a licensed trainer in 2004 and operates Walter Swinburn Racing Stables based at Church Farm in Aldbury, Tring, Hertfordshire.